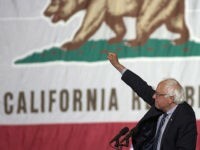 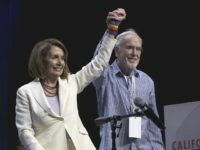 Hundreds of self-described “Bernie-crats” expressed their disdain over Democratic Party establishment favorite Eric Bauman’s victory over grassroots organizer Kimberly Ellis to succeed John Burton as Chairman of California’s Democratic Party last weekend. 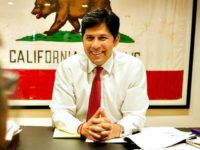 California’s Senate President pro Tem Kevin de Leon might be considering running for governor in 2018, although reports indicate he will not be making an announcement on his decision during the California Democratic convention this weekend. 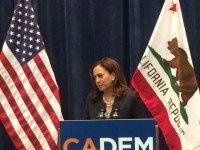 ANAHEIM, California — During a closed session with the press corps at the California Democrats Convention on Saturday, Attorney General Kamala Harris fielded questions from Breitbart News and several other news outlets about her bid for outgoing Sen. Barbara Boxer’s (D-CA) Senate seat. 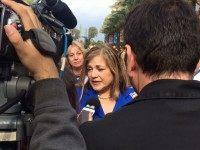 ANAHEIM, California — Two powerful female California Democrats vying for outgoing Sen. Barbara Boxer’s (D-CA) Senate seat, Attorney General Kamala Harris and Rep. Loretta Sanchez, nearly went head-to-head this past weekend at the California Democrats Convention.